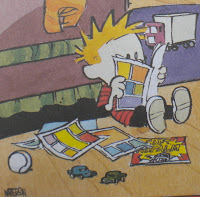 This summer I have been addicted to Calvin and Hobbes! Me (The Big Sister) and The Mom had an idea for this week's challenge: tell us about a book that uses more than just words to tell the story. Please take the challenge, I would like to hear about some more wonderful books! Title of Book, Author, and tell us what the author uses (other than words) to tell the story. I really LOVE Calvin and Hobbes. Thanks to my cousin Gena and her boyfriend Fredi I now have FOUR of my own books... I can never get enough of Calvin, Hobbes and their adventures! The story of Pablo Neruda as a child is enough for a wonderful story, but add the illustrations of Peter Sis and well the story becomes magic! I loved learning about how Neftali becomes Pablo. The pointillistic illustrations are simple yet brilliant. Read a short and sweet Washington Post review here. Well, before there was Calvin and Hobbes, there was Peanuts by Charles Schultz, and following in that same tradition we now have Frazz by Jeff Mallett. Before they were books, they were comic strips in newspapers. Frazz is currently published daily in a number of newspapers but there are also 3 books: Frazz 3.1416, Live from Bryson Elementary, and 99% Perspiration. And Jeff Mallett lives and works in Michigan! Leaving the comic strips, consider The Family of Man, described as "The greatest photographic exhibition of all time -- 503 pictures from 68 countries -- created by Edward Steichen for the Museum of Modern Art. Prologue by Carl Sandburg. This book was copyrighted in 1955, but it is still available and is still AWE INSPIRING. Harold, is a curious four-year-old boy who, with his purple crayon, has the power to create a world of his own simply by drawing it. "Harold and the Purple Crayon" by Crockett Johnson! It has always been one of my favorite! Harold wants to go for a walk in the moonlight, but there is no moon, so he draws one. He has nowhere to walk, so he draws a path. He has many adventures looking for his room, but, in the end, he draws his own house and bed and goes to sleep. I just love that he brings his imagination to life with the help of his purple crayon! My favorite story told almost entirely without words is The Invention of Hugo Cabret by Brian Selznick. What an amazing book. A beautiful story for readers of any age to enjoy!! I love Page by Paige by Laura Lee Gulledge! It is the story of an artist becoming herself and finding her own style. It's a graphic novel (sorta) but the author uses the media to communicate the feeling of that particular thought or drawing of Paige's. It was wonderful and I've read it over and over again! The dog that dug by Jonathan Long and illustrated by Korky Paul - a simple and amusing story of a dog digging for bones, but the detail in the illustrations as the hole gets deeper is fabulous. Actually any book illustrated by Korky is worth a look - not just for the kids, lol!